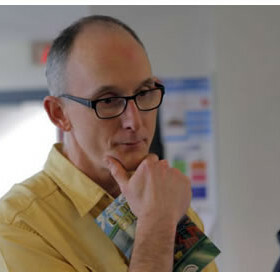 Mr. Orme is Esquimalt High School’s teacher-librarian. After graduating from Esquimalt High School’s 4C Challenge program Mr. Orme studied at McGill University in Montréal. After undergraduate studies in Anthropology and English Literature and graduate studies in Education at McGill Mr. Orme completed his Masters of Education in Library and Information Science and School Administration through the University of Alberta. Mr. Orme has worked in community education as well as at elementary and secondary schools in Quebec and BC and has published and presented workshops both locally and nationally. At Esquimalt High Mr. Orme works with teachers and students to support literacy, guide inquiry-based learning and facilitate critical thinking and creative problem solving. He also helps students and teachers use information technology. His most current work focusses on the role of school libraries and learning commons in nurturing creativity and global awareness.